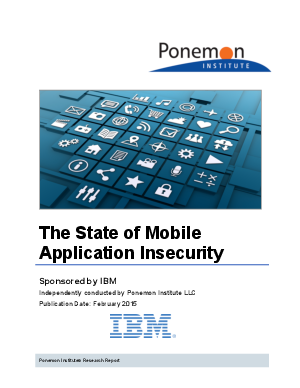 We are pleased to present the findings of The State of Mobile Application Insecurity sponsored by IBM. The purpose of this research is to understand how companies are reducing the risk of unsecured mobile apps in the workplace. Ponemon Institute is dedicated to independent research and education that advances responsible information and privacy management practices within business and government. Our mission is to conduct high quality, empirical studies on critical issues affecting the management and security of sensitive information about people and organizations.